Mustard greens have a peppery, complex flavour and are nutrient-dense despite being extremely low in calories, and high in fibre making them a great diet food that’s also heart healthy. A high vitamin C count in these leaves helps maintain and repair body tissues, keeps your immune system working smoothly and also builds collagen to keep your skin looking youthful and healthy. The concentration of vitamin K is higher than what is found in most leafy veggies and goes a long way to help with bone mineralisation and proper bloood clotting. Like all green leafy vegetables, these contain chlorophyll, which serves as a natural cleanser for the liver. The high fibre levels also helps bring down the amount of toxins in the digestive system and normalise cholesterol levels in the blood. Most of us usually have consumed mustard greens in the famous sarson ka saag. 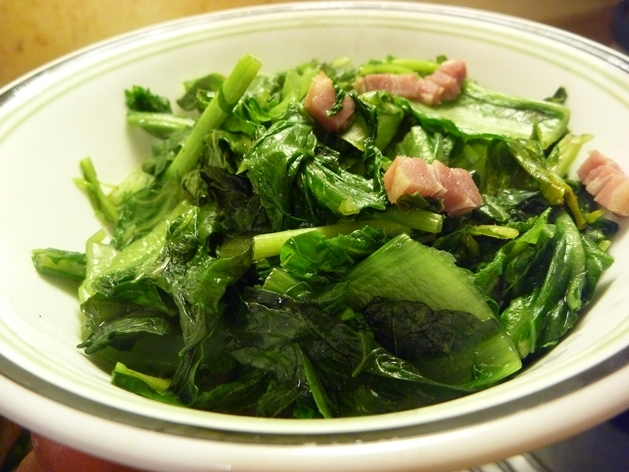 However, there are several equally delicious ways to cook mustard greens. Sautéing is an easy, quick and efficient cooking method that can not only save time but also help preserve the nutritive index of several delicate compounds in food. With mustard greens, it is even simpler, just chop up onion, garlic, season as per taste and serve as a delicious side with lean meats. A simple preparation of mustard greens, spices like turmeric, red chilli, the recipe also uses jaggery and coconut for added flavour. Next time you’re tempted to call for some oily food from your nearest restaurant, make this dish within minutes and serve with phulkas or chapatis. The dish combines the goodness of greens with veggies like tomatoes and peppers that are rich in carotenoids and antioxidants. Chicken broth adds a lot of flavour and increases the nutritive value (vegetarians can substitute with vegetable broth). You don’t need any special cooking skills to make this dish, simply chop your veggies, add them to a pan and toss them periodically. The recipe uses black pepper for seasoning but you can also throw in some thyme and oregano for added flavour and aroma. A one-pot wonder, the dish is ideal when you’re thinking fancy but are lazy to make something elaborate. With mushrooms and condiments like garlic, ginger, pepper, the dish packs in a lot of flavour. With pork added to the mix, the dish is a healthy alternative to get your pork fix – just make sure to keep sesame oil handy, it adds a lot of flavour to the dish.